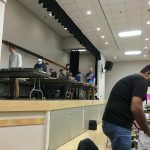 One of our favourite conventions took place this weekend. 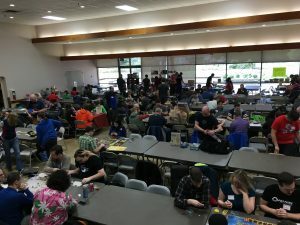 Terminal City Tabletop Convention happened in Burnaby at Bonsor Recreation Centre. This year we were able to attend both days, and our friend Chris joined us. Saturday was the busier of the two days, both in regards to attendance and the number of games we played! It’s also the day the ever popular Board Game Silent Auction takes place–something we always look forward to. 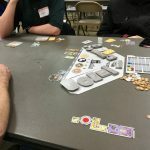 The auction is a great chance for us to find new homes for games we don’t play anymore (it’s only $2 per entry) and it’s a chance for us to pickup new-to-us games for a good price. 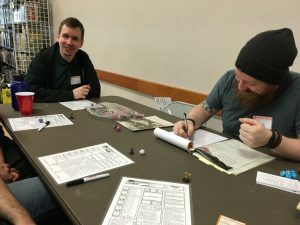 Friend Chris and DM Sean playing 5e. Even since Dungeons & Dragons 5th edition was released I wanted to give it a try. I’d heard good things about it, namely that they really slimmed the system down and put a greater emphasis on actual role playing. Plus watching Critical Role just helped to increase my interest in the game. DM Sean was hosting an intro to D&D5e session using the Starter Box, and we were fortunate that there was space for all three of us to jump in. Sean was a great DM, helping us learn the system, and weaving an interesting story that put the system into action. 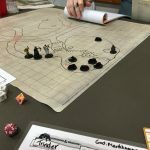 Overall I was impressed with 5e and am looking forward to getting my hands on the Player’s Handbook and possibly running my own campaigns in it. Learning Machi Koro at Terminal City. 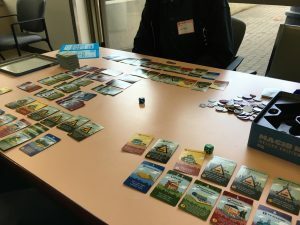 After lunch we borrowed Machi Koro from the library and Chris taught us. It’s a deck building game that’s part strategy, part luck. On your turn you roll a die, which activates abilities in your city, which in turn earns you money. You use the money you earn to build more buildings, and eventually build landmarks. First person to build all their landmarks, wins. I LOVED it. So much so that we ended up purchasing a copy… *cough cough*. Next up was a 6-person game of Star Trek Attack Wing. 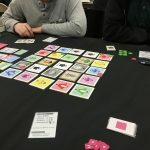 We learned this last year at Gottacon, but it’s a fun game nonetheless. In a simple game, players control various Star Trek vessels and try to blast their opponents out of the sky, being the last vessel standing. This is done using certain ship maneuvers (each ship is different), and different attack abilities. Then you roll dice against your opponent. There are characters and technology that are added to your ships to help enhance them. In a more advanced game, you play certain scenarios based out of the Star Trek universe. 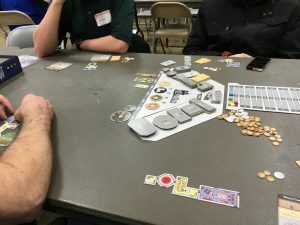 I taught Castles of Mad King Ludwig for our last game of the day. Players are trying to build the craziest castle to impress the Mad King. They do this by purchasing rooms and adding them to their own castles. You get points for particular arrangements, having the most of a certain type of room, and having the most square footage of a certain type of room. This is one I really enjoy that’s on my wish list. It’s amazing how quickly a day can go at a convention! Only a few games played, but it takes up the whole day. The next day we checked out proto-alley. 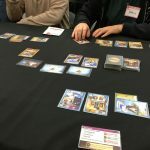 TCTC has always been a big supporter of game developers, always making room for them to demo and get feedback about their in-development games. First up was Overpopulation. You’re randomly given a type of government, which gives you your starting resources. Then you have to balance building resources, keeping your people alive, and earning points. The lovely cards that make up Townbuilder. 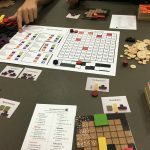 Next we checked out TownBuilder, to see what designer Eric Raué had done in terms of updating since we last played. This game is part resource management, part deck building. Both Blair and I love it, and we can’t wait for it to eventually go up on Kickstarter. 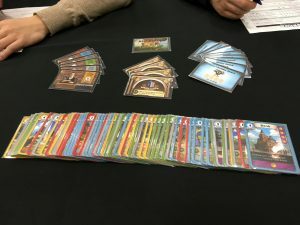 Next we played Eric’s new proto-game, Garden of Shadows. Here you play as ninjas trying to wreck havok during the Emperor’s party. All in all we had a blast again. Thank you Shannon for coordinating another great year of Terminal City.